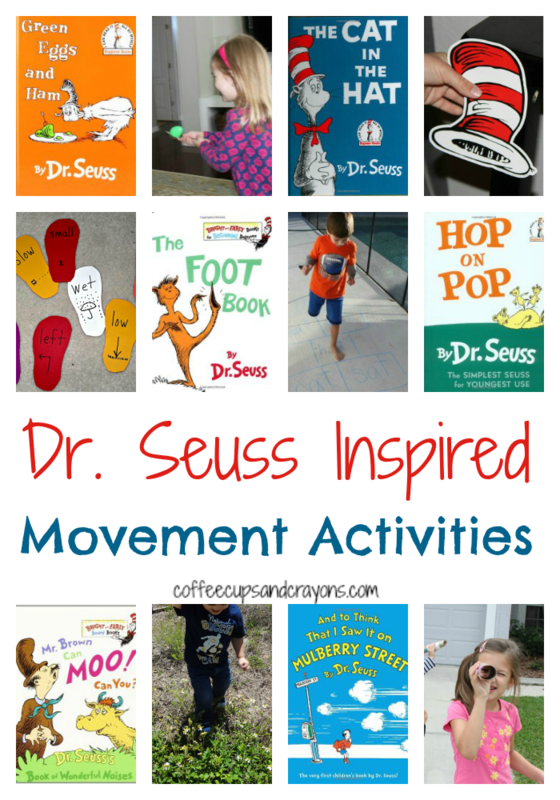 This collection of Dr. Seuss inspired activities gets kids moving! The book pictures are Amazon affiliate links. Practice gross motor skills while conducting a Green Eggs and Ham relay race. Go on a hat pattern hunt and measure with the cat’s hat! Try this Foot Book movement activity from Reading Confetti. Gets kids jumping in no time. Dr. Seuss’s ABC inspired 3 Dinosaurs to do an alphabet gross motor challenge. So fun! Play Hop on Pop hopscotch and practice rhyming words. I love that Dr. Seuss has inspired so many to read and am so thankful that I have had the opportunity to experience it first hand. I had never really loved his book, There’s a Wocket in My Pocket! , until one of my high school students, who had struggled with reading his whole life, rapped it for the elementary school kids at their school celebration. This big, cool high schooler spent days practicing and totally rocked his performance! That day not only fostered a love of reading in the little kids who were attending, it made him and the other kids in my class love and value reading as well. Needless to say There’s a Wocket in My Pocket! had a very special place in my heart. But I have to say the more I’ve learned about Dr. Seuss the more complicated my feelings about his books became. His early racist ads are quite shocking if you haven’t seen them yet and as I have read more about him the more I realized the racist overtones of some of his books. I personally have made the decision to no longer write book activities for his books. As Oprah says, when we know better, we can do better and it no longer feels right for me. We have a large collections of his books and I am not getting rid of them. But I will be teaching my kids more about his past including the racist parts. It’s important to know our history and the impact it’s had on others. And it’s important to me as a blogger to share things with you I would use in my own classroom or family. Trisha is an educator with a passion for science literacy and mom to Aiden and Lily. She's the creator of Inspiration Laboratories, a blog dedicated to encouraging learning through creativity and play, and Read Science, a blog that showcases science activities inspired by children's books. Such a fun roundup! Thanks for including us! So many fun movement ideas. These would be perfect for some Seuss fun on Read Across America Day. Thanks for including our opposite foot trail.